What’s better than eating delicious food? Eating delicious food AND giving back to a great cause at the same time! 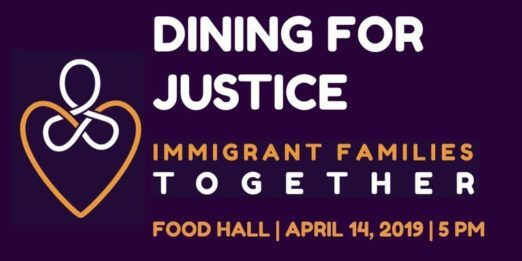 That’s exactly what you can do at Immigrant Families Together‘s second “Dining for Justice“ food fundraiser on Sunday, April 14. First of all, Immigrant Families Together is a network of Americans committed to rejoining families separated by President Trump’s ‘zero tolerance’ immigration policy. The Dining for Justice event will celebrate the power of community with chefs, friends and families all participating to help reunite those separated at the border. Attendees will enjoy unlimited premier chef and drink tasting stations that reflect Queens diversity, right on the beautiful waterfront at Sound River Studios on 4-40 44th Drive in Long Island City. Taking place from 5 to 8 p.m., tickets are $125 each, and children under 12 can attend for free. Participating restaurants include: M Wells Steakhouse, The Queensboro, ERT Restaurant, Pecel Ndeso and Ornella Trattoria. Finally, there will live music by Seth Goldberg and MG4 and an online auction. This follows their first December Dining for Justice event, which was featured in Food & Wine Magazine. See the full list of participants and purchase tickets on Eventbrite here. Above all, 100 percent of the proceeds will go directly to the organization. This will help pay bonds, transportation, legal and medical fees, resettlement, housing and food costs for reunification efforts. You can read more about all of the work Immigrant Families Together does here.